Looking for a tool to create visual contents online? Canva and Snappa are worth-trying stuffs. Well, the two are not fully the same. 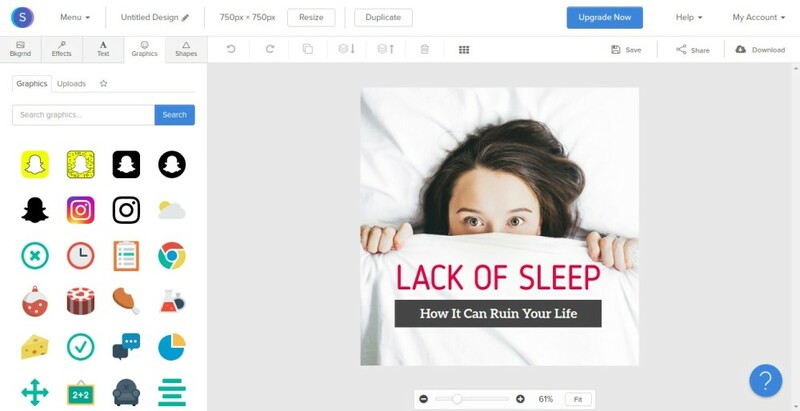 Canva is like a Swiss Army knife which enables you to create nearly all types of designs, while Snappa focuses only on visual contents for social media posts and blog posts. So, comparing the two may looks not fair enough. So, instead of capabilities, I am going to compare the features they both have. Both Canva and Snappa use a freemium business model. To get the most out of the tools, you better upgrade your free account to one of the offered by premium packages, unless you only want to make some testing or not regularly use this sort of tool. Let’s start the comparison from a very basic thing: interface. 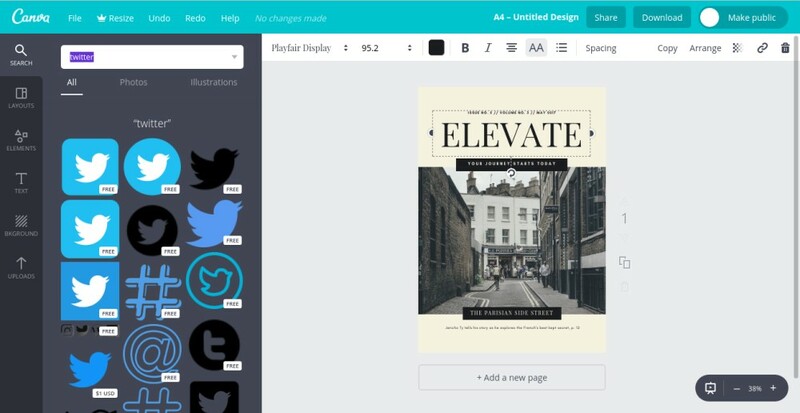 Canva comes with a classic interface of online design tool. The working window is divided into three parts. On the left-most side of the screen lies the main menu which is consists of 6 menus: Search, Layouts, Elements, Text, Background and Upload. Right next to the main menu you will see the selector of element designs. The working canvas takes the most portion of the screen. The interface of Canva is easy enough to learn and use. You won’t meet any serious problem in using it even if you haven’t used this sort of tool before. Changing the default contents provided by the template you chose is extremely easy. To replace texts, simply double-click the text you want to replace and type your desired one. To make some formatting over the texts you can activate the text you want to make the formatting of by clicking on it, a formatting menu will appear right above the canvas. You can make some formatting like changing the font style, color, spacing, alignment and so on. You can also perform several things to each image on your design, like applying filter, cropping or flipping. The handy search box on the top of the element selector makes everything easier. Not much different to Canva. The user interface of Snappa is also easy enough to use. No matter you are new to tools like these or already have some experiences before, you wont’s also meet any serious problem in using Snappa. Unlike Canva, the working window of Snappa is only divided into two parts: a design element selector at the left side and the working canvas on the right side, which takes most screen portion. The main menu of Snappa is located above the element selector. The design element selector of Snappa has a double functions. In addition to selecting design elements, you can also use it format the text. Once you activated a certain text with the aim to format it, the selector will turn into a formatting tool. To replace the default texts from the template you chose, you can also double click the text you want to replace. No different to Canva. Since horizontally the working window of Snappa consists only of two elements, you will see a larger working canvas, making it a better option if you have to work with a smaller screen. There is also a handy search box to help you find images and graphics you need. Both Canva and Snappa allows you to add elements other than the default ones provided by the template you chose. They both allows you to add images, icons and shapes. Since the focus of Snappa is to help you creating visual contents for social media posts and blog posts, it has a limited enough option of elements. Fortunately, you are allowed to upload your own image, be it photo, specific symbol (like your company logo) and so on. There is a fundamental difference between Canva and Snappa in terms of design element. All of the elements offered by Snappa, be it photos, icons and shapes, are free to use. Conversely, not all elements offered by Canva are free to use. There are some photos that require you to pay to use. Although the design elements offered by Snappa are likely to be limited enough, but what it offers are enough to meet your needs. For instance, they has icons of popular services like Twitter, Instagram, Facebook, Blogger, WordPress and lots more. But if you prefer a tool that gives you more options then Canva is the tool. File manager is crucial enough feature if you are regularly using an online design tool like Canva and Snappa. The feature allows you to save and manage the raw (unfinished) designs you have created. Both tools come with a handy file manager feature in which you are allowed to create folders to put together the designs with the same topics. Unfortunately, the feature come with a very tight restrictions for free users. 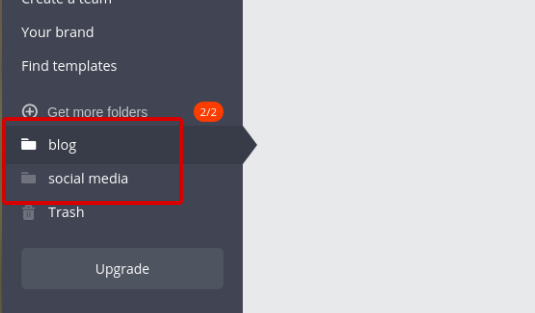 In Canva, free users are only allowed to create the maximum of two folders. What about Snappa? Worse. You won’t be able to create any folder unless you upgrade your account. Even worse, Snappa doesn’t allow free users to save the unfinished designs. In other words (if you stick to free account), there is no “finish it later” if you work with Snappa. Tools like Canva and Snappa are really the savior for those having a poor design skill but want to create a speaking as well as engaging visual contents. What make those tools great is because they provide beautiful templates. You can simply select the appropriate template based on the idea you want to convey and tailor the contents. 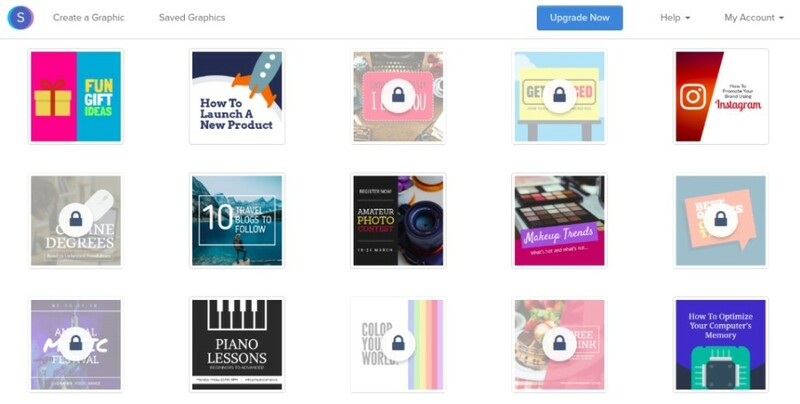 Be it Canva or Snappa offer both free and paid templates. Canva is unbeaten in this part. I can’t find other online design tools that offer more templates than Canva does. The reason why Canva has so many template options (and also photos and other design elements) is because it has an open ecosystem. Canva allows anyone to submit their create works to be used by Canva users, be it free or by charge (visit here to learn more). So, which tool you should use? Well, the answer can be vary depends on what sort of person you are belong to. If you are a sort of person who love being faced with many options then Canva is the suited tool since it has more template options and design elements you can choose from. Conversely, Snappa is a better suited if you hate being faced with too many options. Snappa is also a better option if you have a smaller screen. But overall, both Canva and Snappa are great tool. It allows you to create beautiful visual contents for social media posts as well as blog posts without needing to have an advanced skill in design. It’s especially useful if you have no tools like InDesign or Illustrator installed on your computer. Both Canva and Snappa also come with an online collaboration capability. Hey Haula, thanks for the write-up and Snappa mention. 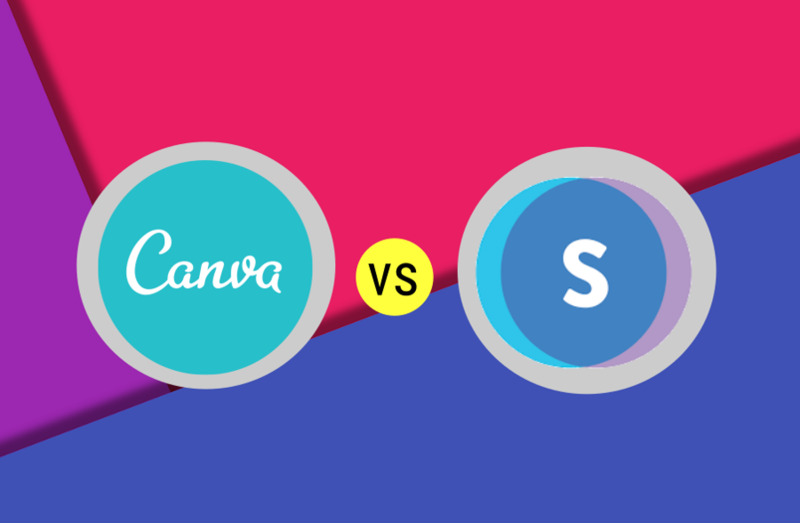 Here is our comparison when comparing Snappa with Canva in case you wanted to have a look!